CityLife is the new district of Milan that rises in the area previously occupied by the historic urban center of the Fair. It is one of the largest urban transformation projects underway in Europe. The project, which covers an area of over 360,000 square meters, bears the signature of world-famous architects including Zana Hadid, Arata Isozaki and Daniel Libeskind. 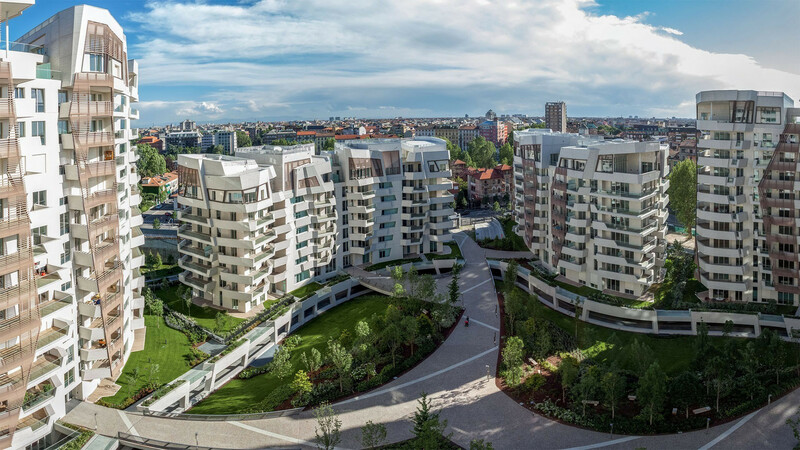 CityLife offers a new way of living, working and spending free time in Milan; a balanced mix of different functions: residences, offices, shops, sports facilities and services, all immersed in a new large public park, the second largest in central Milan. Ballan was responsible for the installation of Steel overhead doors at the complex built by the architect Zara Hadid. The choice fell on this model of steel door to continue the modernity and robustness of the architectural complex in which it was placed. Residences surrounded by gardens and paths that follow the fluid and sinuous trend of the architectural structure, creating an evocative landscape. In the underground parking of the houses, the Steel Up and over garage doors have been installed, they are modern steel doors that are well suited into the architectural context.